The Fox shocks replace the external bypass tubes typically used on off-road race vehicles to manage damping pressure by compactly incorporating multiple bypass zones inside of the shock absorber, offering a cushioned, plush ride while still providing for bottoming resistance. The three come with 2.5-inch TRD Pro-exclusive Fox Internal Bypass shocks, but each are specifically tuned to suit the individuality of each by Toyota Racing Development engineers. LED lighting is also in store for the 2019 Tundra TRD Pro, plus a new hood scoop and more TRD Pro badges. Toyota wants to change the pickup game with the 2019 Tundra TRD, 2019 4Runner TRD and 2019 Tacoma TRD Pro. Each model features a distinct rear spring configuration, and TRD dust boots feature in the front and rear to help keep out dust and dirt. However, the highlight for 2019 is a snorkel called the TRD Desert Air Intake, helping the 3.5-liter keep running under more hard conditions. The Tacoma TRD Pro, for example, finally gets a standard JBL sound system, along with an updated front skid plate with "TRD" red lettering, while the cat-back exhaust is accented with a new dark chrome tip. That vehicle has Entune Premium JBL audio with a subwoofer and integrated NAV. The snorkel is not meant to allow the Tacoma TRD Pro to travel under water, but as anyone with an internet connection knows, that is what makes the best videos. A moonroof is optional. Aside from the Fox shocks that will be standard fittings for all 2019 TRD Pro lines, the 2019 Tacoma TRD Pro will have a few exterior updates in addition to its own specific suspension improvements, as well. It also gets a new roof rack, a blacked-out grille and projector-beam headlights with smoked trim. 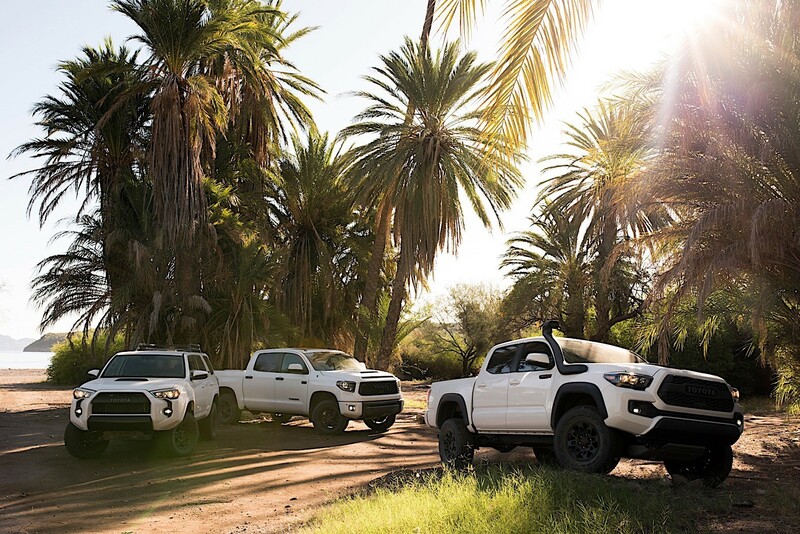 The 2019 TRD Pro series will be available in fall of 2018, and each vehicle will be offered in three colors that include Super White, Midnight Black Metallic or Voodoo Blue (a TRD Pro exclusive).